An autonomous spaceport drone ship (ASDS) is an ocean-going vessel derived from a deck barge, outfitted with station-keeping engines and a large landing platform. Construction of such ships was commissioned by aerospace company SpaceX to allow for recovery of rocket first-stages at sea for missions which do not carry enough fuel to return to the launch site after boosting spacecraft onto an orbital trajectory. Of Course I Still Love You carries the first rocket that successfully landed on a drone ship (Falcon 9 FT, CRS-8 mission, 8 April 2016). SpaceX has two operational drone ships and has a third under construction as of early 2018. Just Read the Instructions operates in the Pacific for launches from Vandenberg; Of Course I Still Love You operates in the Atlantic for launches from Cape Canaveral. A Shortfall of Gravitas is under construction. As of 11 April 2019[update], 29 Falcon 9 flights have attempted to land on a drone ship, with 23 of them succeeding. In 2009, SpaceX CEO Elon Musk articulated ambitions for "creating a paradigm shift in the traditional approach for reusing rocket hardware." In October 2014, SpaceX publicly announced that they had contracted with a Louisiana shipyard to build a floating landing platform for reusable orbital launch vehicles. Early information indicated that the platform would carry an approximately 90-by-50-meter (300 ft × 160 ft) landing pad and would be capable of precision positioning so that the platform could hold its position for launch vehicle landing. On 22 November 2014 Musk released a photograph of the "autonomous spaceport drone ship" along with additional details of its construction and size. As of December 2014, the first drone ship used, the McDonough Marine Service's Marmac 300 barge, was based in Jacksonville, Florida, at the northern tip of the JAXPORT Cruise Terminal (30°24′33″N 81°34′57″W﻿ / ﻿30.409144°N 81.582493°W﻿ / 30.409144; -81.582493) where SpaceX built a stand to secure the Falcon stage during post-landing operations. The stand consists of four 15,000 lb (6,800 kg), 107 in (270 cm) tall and 96.25 in (244.5 cm) wide pedestal structures bolted to a concrete base. A mobile crane will lift the stage from the ship and place it on the stand. Tasks such as removing or folding back the landing legs prior to placing the stage in a horizontal position for trucking will occur here. The ASDS landing location for the first landing test was in the Atlantic approximately 200 miles (320 km) northeast of the launch location at Cape Canaveral, and 165 miles (266 km) southeast of Charleston, South Carolina. SpaceX's Just Read the Instructions, based on the Marmac 300 deck barge, in position for a landing test on Falcon 9 Flight 17 in April 2015. On 23 January 2015, during repairs to the ship following the unsuccessful first test, Musk announced that the ship was to be named Just Read the Instructions, with a sister ship planned for west coast launches to be named Of Course I Still Love You. On 29 January, SpaceX released a manipulated photo of the ship with the name illustrating how it would look once painted. Both ships are named after two General Contact Units, spaceships commanded by autonomous artificial intelligences, that appear in The Player of Games, a Culture novel by Iain M. Banks. The first Just Read the Instructions was retired in May 2015 after approximately six months of service in the Atlantic, and its duties were assumed by Of Course I Still Love You. The former ASDS was modified by removing the wing extensions that had extended the barge surface and the equipment (thrusters, cameras and communications gear) that had been added to refit it as an ASDS; these items were saved for future reuse. In 2018, SpaceX began construction of a third barge, A Shortfall of Gravitas. In early 2015, SpaceX leased two additional deck barges—Marmac 303 and Marmac 304—and initiated refit to construct two additional autonomous-operation-capable ASDS ships, built on the hulls of these Marmac barges. The second ASDS barge, Of Course I Still Love You (OCISLY), had been under construction in a Louisiana shipyard since early 2015 using a different hull—Marmac 304—in order to service launches on the east coast. It was built as a replacement for the first Just Read the Instructions and entered operational service for Falcon 9 Flight 19 in late June 2015. As of June 2015, its home port was Jacksonville, Florida, but after December 2015, it was transferred 160 miles (260 km) further south, at Port Canaveral. While the dimensions of the ship are nearly identical to the first ASDS, several enhancements were made including a steel blast wall erected between the aft containers and the landing deck. The ship was in place for a first-stage landing test on the CRS-7 mission, which failed on launch on 28 June 2015. On 8 April 2016 the first stage, which launched the Dragon CRS-8 spacecraft, successfully landed for the first time ever on OCISLY, which is also the first ever drone ship landing. In February 2018, the Falcon Heavy Test Flight's central core exploded upon impact next to OCISLY that damaged two of the four thrusters on the drone ship. Two thrusters were removed from the Marmac 303 barge in order to repair OCISLY. The third ASDS barge, using the Marmac 303 hull, was built during 2015 in a Louisiana shipyard, and the barge transited the Panama Canal in June 2015 carrying its wing extensions as cargo on the deck because the ASDS, when complete, would be too wide to pass through the canal. The home port for the Marmac 303 is the Port of Los Angeles, at the AltaSea marine research and business campus in San Pedro's outer harbor. The landing platform and tender vessels began docking there in July 2015 in advance of the main construction of AltaSea which is scheduled for 2017. SpaceX announced that the Marmac 303 would be the second ASDS to be named Just Read the Instructions (JRtI) in January 2016, shortly before its first use as a landing platform for Falcon 9 Flight 21. On 17 January 2016, JRtI was put to first use in an attempt to recover a Falcon 9 first-stage booster from the Jason-3 mission from Vandenberg. The booster successfully landed on the deck; however, a lockout collet failed to engage on one of the legs causing the rocket to tip over, exploding on impact with the deck. On January 14, 2017, SpaceX launched Falcon 9 Flight 29 from Vandenberg and landed the first stage on the JRtI that was located about 370 km (230 mi) downrange in the Pacific Ocean, making it the first successful landing in the Pacific. SpaceX began construction of a fourth deck barge in early 2018. The fourth ASDS was announced to be under construction in February 2018 and it will become the second active east coast-based ASDS. It will be homeported at Port Canaveral. This future simultaneously usable ASDS, along with OCISLY, is called A Shortfall of Gravitas (ASoG) and like the rest of the fleet, its naming is based on names used in the Culture series. The droneship is expected to be operational in mid-2019. The ASDS are autonomous vessels capable of precision positioning, originally stated to be within 3 meters (9.8 ft) even under storm conditions, using GPS position information and four diesel-powered azimuth thrusters. In addition to the autonomous operating mode, the ships may also be telerobotically controlled. The azimuth thrusters are hydraulic propulsion outdrive units with modular diesel-hydraulic-drive power units manufactured by Thrustmaster, a marine equipment manufacturer in Texas. The returning rocket must not only land within the confines of the deck surface but must also deal with ocean swells and GPS errors. SpaceX equips the ships with a variety of sensor and measurement technology to gather data on the booster returns and landing attempts, including commercial off the shelf GoPro cameras. At the center of the ASDS landing pads is a circle that encloses the SpaceX stylized "X" in an X-marks-the-spot landing point. The two ASDS names used so far, Just Read the Instructions (JRtI), and Of Course I Still Love You (OCISLY), pay homage to the works of the late science fiction author Iain M. Banks by being based on his Culture fictional universe. Both JRtI and OCISLY are names of enormous, sentient starships, which appeared in the novel The Player of Games. The third name that will be used for the fourth ASDS will be A Shortfall of Gravitas (ASoG) that is similarly drawn from the Culture-milieu of Iain M. Banks. The Culture series has a running gag on having some starships that include "Gravitas" within their names. 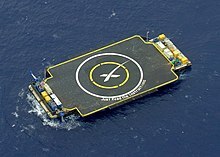 The landing platform of the upper deck of the first barge named Just Read the Instructions was 52 m × 91 m (170 ft × 300 ft) while the span of the Falcon 9 v1.1 landing legs was 18 m (60 ft). The vessel was retired in 2015. Of Course I Still Love You was built as a refit of the barge Marmac 304 for landings in the Atlantic Ocean. Its homeport is in Port Canaveral, Florida since December 2015, after being ported for a year at the Port of Jacksonville during most of 2015. Just Read the Instructions, the second barge with that name, was built as a refit of the barge Marmac 303 in 2015 for landings in the Pacific Ocean. Its homeport is the Port of Los Angeles, California. The fourth ASDS is named A Shortfall of Gravitas, under construction as of early 2018, will be used on the east coast to support high flight rates for Falcon 9 and tandem ocean landings for Falcon Heavy side boosters. A tug is used to bring the ASDS to its oceanic position, and a support ship stands by some distance away from the crewless ASDS. The vessels initially used on the east coast were Elsbeth III (tug) and Go Quest (support). Following landing, technicians and engineers typically board the landing platform, and secure the rocket's landing legs to lock the vehicle in place for transport back to port. The rocket stage is secured to the deck of the drone ship with steel hold downs welded on to the feet of the landing legs. In June 2017, OCISLY started being deployed with a robot that drives under the rocket and grabs onto the hold-down clamps located on the outside of the Falcon 9's structure after landing. Fans call the robot "Optimus Prime" or "Roomba," the latter of which has been turned into a backronym for "Remotely Operated Orientation and Mass Balance Adjustment." First-stage of Falcon 9 at its first successful landing on the Of Course I Still Love You in April 2016. The first flight test was 10 January 2015 when SpaceX conducted a controlled-descent flight test to land the first-stage of Falcon 9 Flight 14 on a solid surface after it was used to loft a contracted payload toward Earth orbit. SpaceX projected prior to the first landing attempt that the likelihood of successfully landing on the platform would be 50 percent or less. The landings went from being landing tests towards being routine parts of missions. First stage of Falcon 9 Flight 21 descending to the ASDS. The first time that the first stage of a Falcon 9 landed on a drone ship. ^ a b c d e Harwood, William (16 December 2014). "SpaceX readies rocket for station launch, barge landing". CBS News. Retrieved 23 December 2014. A 300-foot-long barge will be used as an off-shore landing platform during launch of a SpaceX Falcon 9 rocket Friday. The primary goal of the flight is to deliver critical supplies and equipment to the space station, but SpaceX hopes to land the rocket's first-stage on the barge for possible refurbishment and reuse – a key milestone in the company's push to reduce launch costs. ^ SpaceX Dragon Headed to the ISS. 8 April 2016 – via YouTube. ^ a b c d e f Bergin, Chris (24 November 2014). "SpaceX's Autonomous Spaceport Drone Ship ready for action". NasaSpaceFlight.com. Retrieved 24 November 2014. ^ a b Foust, Jeff (25 October 2014). "Next Falcon 9 Launch Could See First-stage Platform Landing". Space News. Retrieved 25 October 2014. ^ a b c Bullis, Kevin (26 October 2014). "SpaceX Plans to Start Reusing Rockets Next Year". MIT Technology Review. Retrieved 25 October 2014. ^ a b Musk, Elon (22 November 2014). "Autonomous spaceport drone ship". SpaceX. Retrieved 23 November 2014. ^ "DRAFT Environmental Assessment for the Space Exploration Technologies Vertical Landing of the Falcon Vehicle and Construction at Launch Complex 13 at Cape Canaveral Air Force Station Florida" (PDF). U.S. Air Force. October 2014. p. 17. Archived from the original (PDF) on 8 January 2015. Retrieved 8 January 2015. ^ Clark, Stephen (16 December 2014). "Photos: SpaceX's autonomous spaceport drone ship". Spaceflight Now. Retrieved 16 December 2014. ^ Musk, Elon (23 January 2015). "Repairs almost done..." Twitter.com. ^ a b c Musk, Elon (23 January 2015). "West Coast droneship under construction..." Twitter.com. ^ a b Musk, Elon (29 January 2015). "Painting the name on the droneship..." Twitter.com. ^ Wall, Mike. "Elon Musk Names SpaceX Drone Ships in Honor of Sci-Fi Legend". Space.com. Retrieved 30 June 2015. ^ a b c d e f g h Smedley, Jesse (18 June 2015). "SpaceX Augments and Upgrades Drone Ship Armada". NASASpaceFlight.com. Retrieved 18 June 2015. ^ a b SpaceX (6 Feb 2018). "Space X News Conference". youtube.com. Retrieved 2018-02-06. ^ "SpaceX's drone ship fleet spied prepping for future rocket recoveries". Teslarati.com. 26 March 2018. Retrieved 27 March 2018. ^ "SpaceX Planning To Base Rocket, Spacecraft Retrieval At Port Of Los Angeles". CBS Los Angeles. 18 June 2015. Retrieved 18 June 2015. ^ Littlejohn, Donna (18 June 2015). "Groundbreaking partnership announced between SpaceX and AltaSea in San Pedro". Redlands Daily Facts. Retrieved 19 June 2015. ^ Graham, William (17 January 2016). "SpaceX Falcon 9 v1.1 set for Jason-3 launch". NASASpaceFlight.com. Retrieved 17 January 2016. For the barge that will be used, an ASDS based on the Marmac 303 barge and bearing the name Just Read the Instructions, it will be the first recovery attempt. The name "Just Read the Instructions", an homage to the literary works of Iain M. Banks, was previously borne by the first ASDS, based on the Marmac 300 barge. ^ Pasztor, Andy (17 January 2016). "SpaceX Stumbles, as Booster Landing Fails". Wall Street Journal. Retrieved 19 January 2016. ^ a b Kelly, Emre (12 February 2018). "Elon Musk: New SpaceX drone ship, A Shortfall of Gravitas, coming to East Coast". Florida Today. Retrieved 13 February 2018. ^ a b Johnson, Scott (25 November 2014). "SpaceX CRS-5: Grid-Fins and a Barge". Spaceflight Insider. Retrieved 4 January 2015. ^ "MARMAC 300 (1063184)". Boat Database. Retrieved 17 December 2014. ^ Evans, Ben (January 2015). "SpaceX Autonomous Spaceport Drone Ship Sets Sail for Tuesday's CRS-5 Rocket Landing Attempt". AmericaSpace. Retrieved 9 April 2015. ^ "SpaceX Announces Spaceport Barge Positioned by Thrustmaster's Thrusters". Thrustmaster. 22 November 2014. Archived from the original on 7 December 2014. Retrieved 23 November 2014. . Additional archives: 23 November 2014. ^ a b Bergin, Chris (18 November 2014). "Pad 39A – SpaceX laying the groundwork for Falcon Heavy debut". NASA Spaceflight. Retrieved 17 November 2014. ^ . Shotwell, Gwynne (3 February 2016). Gwynne Shotwell comments at Commercial Space Transportation Conference. Commercial Spaceflight. Event occurs at 2:43:15–3:10:05. Retrieved 4 February 2016. Those are GoPro cameras by the way, unbelievable technology. We fly many of them. ... Our third attempt to land on a drone ship ... this past January ... we did stick the landing, we stuck it and then we unstuck it. ... I love these videos. I think these videos are great! You learn so much from this activity. ... for all of you curmudgeons who say that was a failure, you're totally wrong. We landed. We broke a leg. We learned a little bit. And we're going to land again. ... this is the previous version of the rocket. The landing legs weren't quite as robust ... from a previous design era. ^ Chris Bergin (24 November 2014). "SpaceX's Autonomous Spaceport Drone Ship ready for action". NASA Spaceflight.com. ^ "Learn to tell science stories". Editorial. Nature. 555: 141–2. 7 March 2018. doi:10.1038/d41586-018-02740-5. ^ Cofield, Calla (9 April 2016). "SpaceX Sticks a Rocket Landing at Sea in Historic First". Scientific American. Space.com. ^ Elon Musk [@elonmusk] (12 February 2018). "A Shortfall of Gravitas" (Tweet) – via Twitter. ^ "Iain M Banks Q&A". Guardian. 11 September 2000. Retrieved 2009-03-09. ^ a b "SpaceX rocket docks at San Pedro home port after successful mission". dailynews.com. 17 January 2017. Retrieved 31 January 2017. ^ "SpaceX Autonomous Spaceport Drone Ship Sets Sail for Tuesday's CRS-5 Rocket Landing Attempt". AmericaSpace. April 4, 2015. Retrieved 2017-12-20. ^ Bergin, Chris (2016-04-12). "Falcon 9 first stage sails into Port Canaveral atop ASDS – ahead of big plans". nasaspaceflight.com. Retrieved 2017-01-16. ^ "Photos of Falcon 9 B1029.2 entering Port Canaveral, with the roomba visible beneath the rocket. Credit: Michael Seeley / We Report Space • r/spacex". reddit. Retrieved 2017-12-31. ^ Bergin, Chris (17 December 2014). "SpaceX confirms CRS-5 launch slip to January 6". NASASpaceFlight.com. Retrieved 18 December 2014. ^ a b Clark, Stephen (10 January 2015). "Dragon successfully launched, rocket recovery demo crash lands". Spaceflight Now. Retrieved 10 January 2015. Musk, Elon (10 January 2015). "Rocket made it to drone spaceport ship..." Twitter.com. Musk, Elon (10 January 2015). "Ship itself is fine..." Twitter.com. Musk, Elon (10 January 2015). "Didn't get good landing/impact video..." Twitter.com. ^ Musk, Elon (11 February 2015). "Rocket soft landed in the ocean..." Twitter.com. ^ Musk, Elon (14 April 2015). "Ascent successful..." Twitter.com. ^ Musk, Elon (14 April 2015). "Looks like Falcon landed fine..." Twitter.com. ^ Harwood, William (28 June 2015). "SpaceX Falcon 9 rocket destroyed in launch mishap". CBS News. Retrieved 28 June 2015. ^ "SpaceX Plans Drone Ship Rocket Landing for Jan. 17 Launch", NBC News, 7 January 2016, accessed 12 January 2016. ^ Jason-3 Hosted Webcast. SpaceX. 17 January 2016. Event occurs at 1:06:30 (25:20 after lift-off). Retrieved 17 January 2016. ^ "Elon Musk on Twitter". Twitter. ^ Boyle, Alan (17 January 2016). "SpaceX rocket launches satellite, but tips over during sea landing attempt". GeekWire. Retrieved 18 January 2016. ^ Elon Musk [@elonmusk] (2016-03-05). "Rocket landed hard on the droneship. Didn't expect this one to work (v hot reentry), but next flight has a good chance" (Tweet) – via Twitter. ^ "Watch SpaceX achieve first-ever sea landing of reusable rocket". Los Angeles Times. 7 April 2016. Retrieved 14 April 2016. ^ a b Chris, Bergin (12 April 2016). "Falcon 9 first stage sails into Port Canaveral atop ASDS – ahead of big plans". NASA Spacefight. Retrieved 13 April 2016. ^ SpaceX successfully lands its Falcon 9 rocket on a floating drone ship again The Verge, Retrieved 6 May 2016. ^ SpaceX lands fourth booster after successful Falcon 9 launch Florida Today, Retrieved 27 May 2016. ^ Live coverage: Pioneering telecom satellites launching today on Falcon 9 Spaceflightnow Retrieved 15 June 2016. ^ "Elon Musk on Twitter". Twitter. Retrieved 2016-06-15. ^ Clark, Stephen (14 August 2016). "Falcon 9 rocket launches Japanese satellite, then nails bullseye landing". Spaceflight Now. ^ "First stage has landed on Just Read the Instructions – SpaceX on Twitter". Twitter. Retrieved 2017-01-14. ^ CNN, Azadeh Ansari and Jackie Wattles. "SpaceX returns to flight, nails rocket landing". CNN. Retrieved 2017-01-14. ^ SpaceX (5 Mar 2018). "Hispasat 30W-6". youtube.com. Retrieved 2018-04-03. ^ "SpaceX rocket test-fired at Cape Canaveral for NASA telescope launch". April 11, 2018. Retrieved April 14, 2018. ^ "Prelaunch Preview – SpaceX Demonstration Mission 1". Everyday Astronaut. 2019-02-28. Retrieved 2019-03-02. ^ "SpaceX Falcon Heavy launches Arabsat-6A". April 11, 2019. Retrieved April 11, 2019. ^ "SpaceX's Center Core Booster for Falcon Heavy Rocket Is Lost at Sea". April 15, 2019. Retrieved April 16, 2019. Wikimedia Commons has media related to Autonomous spaceport drone ship.